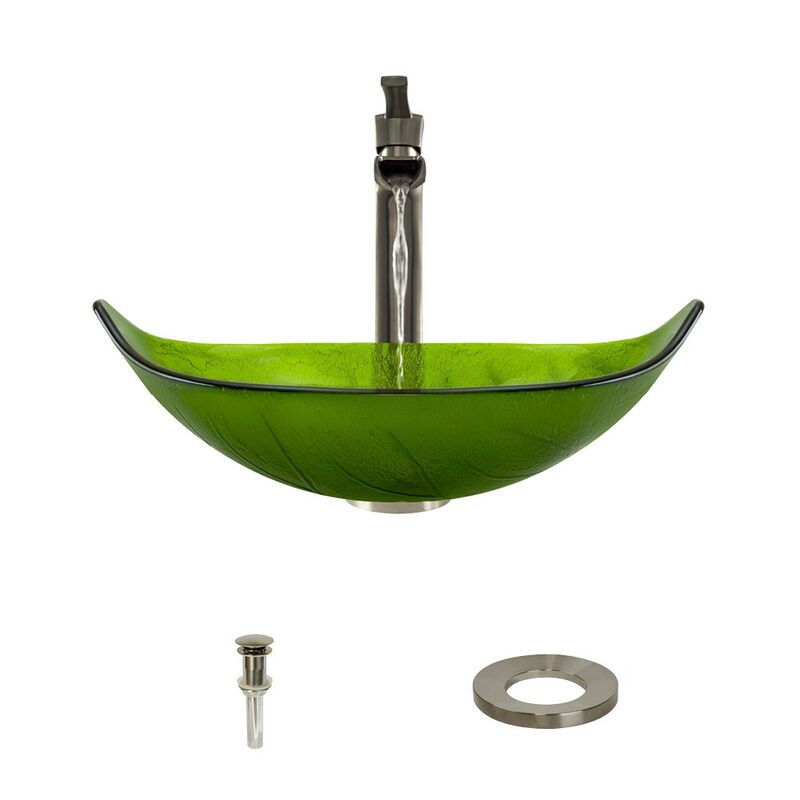 This 1/2" thick, tempered-glass vessel is leaf-shaped, with a translucent-green appearance and dark veins throughout. Its interior is smooth while its exterior has a stippled texture. Its non-porous surface is extremely attractive and sanitary - naturally resistant to stains, odors, discoloration, and heat damage. With an overall measurement of 23 1/4" x 14 1/2" x 4 3/4", it will require a minimum-width cabinet of 24". The 731-BN , single-handle, vessel faucet reaches a height of 12 1/4" and features a classic trough-style spout with a 4" reach. Its sleek lines gradually widen and contract to create a stunning design statement. The single handle has a flat top with an inverse curve below to mimic the spout design; and it easily sets just the right water flow and temperature. Ceramic disc cartridges assure long-term, dependable operation, and a beautiful brushed nickel finish completes its distinctive appearance. The faucet is constructed without lead and is compliant with NSF (National Sanitation Foundation) standards, the Safe Drinking Water Act, the cUPC (Uniform Plumbing Code of the United States and Canada), the ADA (American Disabilities Act) and carries the EPAs WaterSense label. The included sink ring stabilizes the curved bowl above the counter and coordinates with the brushed nickel finish of the other fixture's. Additionally, a spring-loaded, vessel pop-up drain (vpud) is included, which opens and closes with a simple press to its attractive brushed nickel cap.